South elevation, rear of house. A wood frame structure with a single-pitch roof located on a sloping site. The V-shaped house opens to the south with two full stories. The house is more closed and private at the north with a single story at the entry. The roof overhangs all four sides of the house. The overhang at the front creates a covered carport. Acrylic dome skylights are set into the tar and gravel roof. The overhand to the south provides protection from the hot summer sun. Armstrong designed this house in 1950. The design has a great deal in common with his solar house prototype design of 1947. 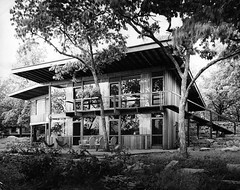 This form of residential architecture, with its intimate relationship to its site and climate, became a touchstone of Armstrong's work throughout his career.